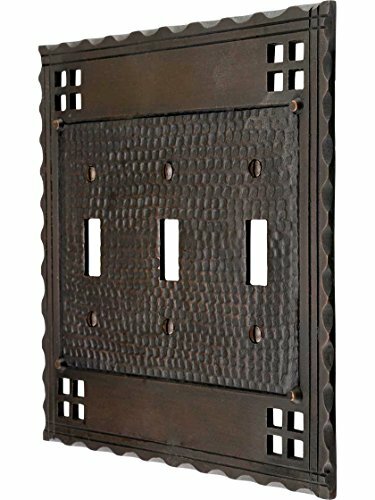 Pacific Hardware's circa 1912 "Bastile" pattern inspired our creation of this striking Craftsman-style switchplate. We've replicated the unique window-pane design, with its incised border and characteristic hammered surface, in solid, cast brass. An oil-rubbed bronze finish with copper highlights completes the authentic look. Please note that these plates are entirely flat on the reverse (some plate styles have a slight recess). To ensure that your Craftsman cover plates sit flush against the wall surface, all switches and outlets must be properly inset within the wall. Dimensions: 6 3/4" H x 6 3/8" W. Projection: 1/8".